Circular Wall Memorial dedicated in Salem,Ma. 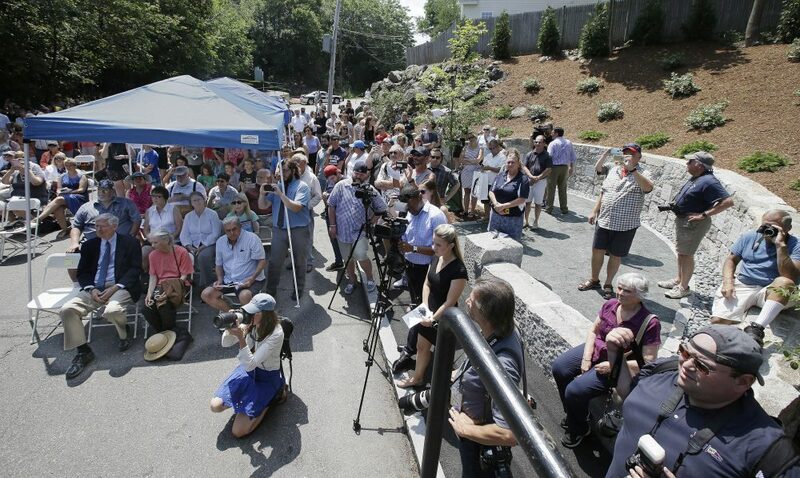 Salem residents and descendants of people put to death gathered in chairs abutting the new memorial for the dedication ceremony. 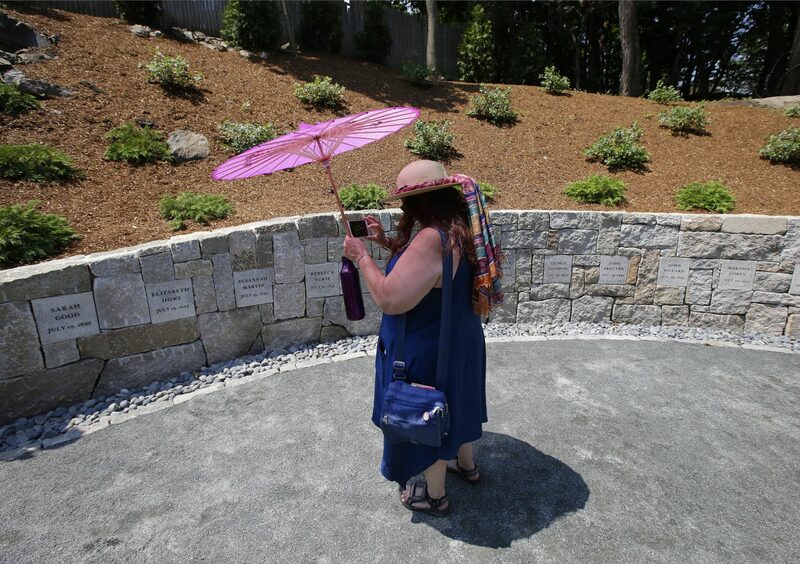 The memorial is a freshly landscaped crescent-shaped plot with plantings, mulch and a swoop of granite wall. Chunky, gray blocks are etched with the names of the victims and the dates they were killed. The Rev. Jeffrey Barz-Snell, of the First Church in Salem, welcomed the crowd. Barz-Snell added that in 1692, Rebecca Nurse, who was one of five killed at Proctor’s Ledge on a hot, July afternoon like today, was a member of his congregation. Barz-Snell said his predecessor, the Rev. Nicholas Noyes, helped fan the flames of hysteria that engulfed Salem. 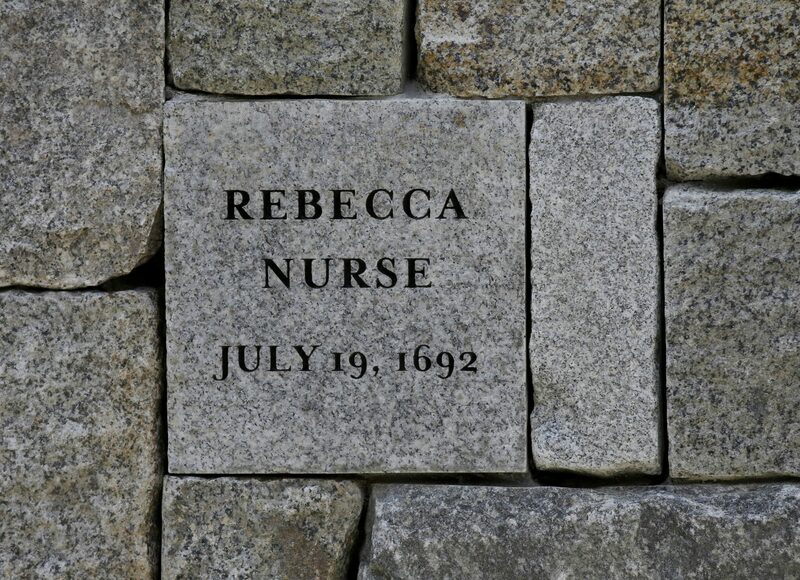 Among the descendants was Gail Garda, president of the Towne Family Association and a relative of Rebecca Nurse. Towne was Nurse’s maiden name. Garda asked the crowd to imagine how hard it was for the settlers who emigrated from England to Massachusetts, searching for a better life and religious freedom. Others drew parallels to society today, including Salem Mayor Kim Driscoll. City Councillor David Eppley evoked the names of neighborhoods in Salem — Witchcraft Heights and Gallows Hill — as he shared how impossible it was to offer apologies to the affected families and descendants. Proctor’s Ledge was identified as an execution site in January 2016 by a team of researchers that included Salem State University professor Emerson “Tad” Baker. Baker added that with that title comes responsibilities. Rev. Barz-Snell concluded the dedication ceremony with a “prayer of committal” — usually evoked at funerals to aid the victims to a peaceful, eternal rest. The Proctor’s Ledge memorial is meant to be a place of quiet reflection. It’s situated in a residential area, just a block from a Walgreens. It isn’t the first witch trial memorial in Salem — another was unveiled in 1992 to mark the 300th anniversary of the hangings. Even so, some say this new one has been a long time coming. A Thank You Teachers raffle at Children’s Book Cellar in Waterville! If you are in Waterville,Maine this summer stop by Children’s Book Cellar and enter my author visit raffle. Grade 2-8 Parents,students and teachers enter to win. Why is Maria’s Shoes so short? An insightful answer from a child in Hawaii. A Hawaiian instructor shared…. ” I read Maria’s Shoes and at the end a child asked why the book was so short? Another child thought the book was so short because they want us to know how easy it is to help someone feel better because it doesn’t take too long!